We may have closed the books on 2018, but the employment law changes, high profile sexual harassment cases and data breach headlines of the previous year will continue to impact business owners in 2019. 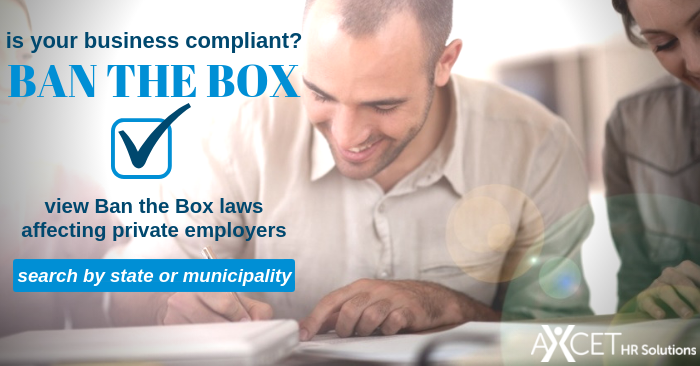 From businesses attempting to navigate their way through the Internal Revenue Code changes, to learning how to be compliant with “Ban the Box” and medical marijuana laws, one thing is for sure - it was a busy year. Here is a quick review of the year’s most notable issues impacting business owners and HR professionals. The Tax Cuts and Jobs Act (TCJA) took effect January 1, 2018, and made sweeping changes to the Internal Revenue Code. The TCJA included trillions of dollars in tax cuts and benefits for workers and business owners. It slashed the corporate tax rate from 35 percent to 21 percent, lowered individual tax rates for five of the seven tax brackets, nearly doubled the standard deductions and lessened the tax burden on pass-through business like S-corporations, LLCs and partnerships. Due to these changes, the IRS issued multiple bulletins requesting all taxpayers to check their federal withholding. The goal of the IRS “Paycheck Checkup” was to ensure proper withholding and prevent tax time surprises. You can read more about the IRS recommended “Paycheck Checkup” in this blog. Read this blog to find out how the Tax Cuts and Jobs Act has impacted business owners and individuals. On Election Day 2018, Missouri voters cast their ballots approving the use of medical marijuana, making Missouri one of 33 states having passed legislation permitting its use. Here’s everything employers need to know about Amendment 2. Missouri business owners likely won’t see their first employee or applicant with a medical marijuana prescription until late 2019 or early 2020, but in the meantime, employers should learn about their rights, understand how to remain compliant, update their policies and offer training sessions for managers. To find out how medical marijuana in the workplace impacts safety, read this blog by Axcet HR Solutions Safety and Health Consultant Randy Clayton. And remember, in Missouri, under Amendment 2, employers still have the right to remain a drug free workplace. On June 9, 2018, Ban the Box took effect in Kansas City. Under the rules of Section 38-104, Kansas City employers with six or more employees — public and private — are prohibited from making hiring or promotional decision inquiries into a prospective employee’s criminal history until after determining the individual is otherwise qualified for the position, and only after the applicant has been interviewed for the position. It is important to note, employers will not be prevented from inquiring about an applicant’s criminal history, rather the new law will delay the inquiry. Nationwide, 33 states and over 150 cities and counties have adopted the fair chance hiring law. Since April 2017, 263 celebrities, politicians, CEOs and others have been accused of sexual harassment, assault or other misconduct, and that number just keeps growing as more and more victims come forward. The #MeToo movement has jolted the workplace and has brought sexual harassment prevention to the forefront for business owners and managers. 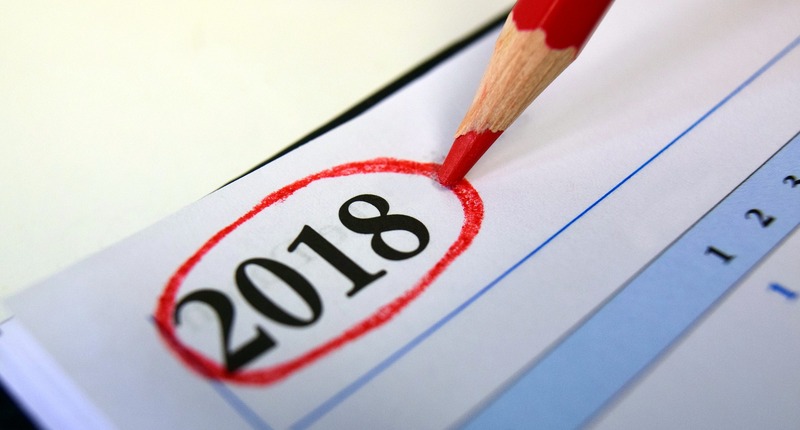 In 2018, business owners made it a top priority to establish clear policies. Even those with existing policies in place worked hard to reassess and revise them. But it didn’t stop there. Additional steps to prevent harassment were implemented, including manager training sessions and workshops. In fact, one of our experienced Human Resources Consultants shared her expertise at a Lenexa Chamber of Commerce Lunch and Learn last year, educating area business owners and HR managers about how to prevent harassment and create a respectful work environment. Axcet clients can look for a reprise of the presentation coming up in 2019. You can read more about it here. Find out five new sexual harassment workplace rules in a #MeToo world. It swept news headlines weekly - yet another data breach compromising the personal information of millions of people around the world. 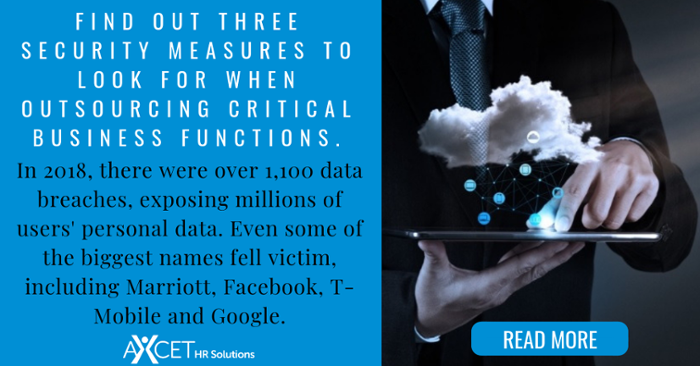 From healthcare providers to social networks and retailers, some of the biggest names fell victim and were forced to inform their customer base about the varying types of personal data that was compromised. With over 1,100 data breaches, 2018 may very well be remembered as “The Year of the Data Breach”. Big names including Google+, Facebook, Marriott and T-Mobile grabbed headlines and the attention of millions. One of the most talked about data breaches was Facebook’s. Unfortunately, the social network giant fell victim multiple times, with 100 million users compromised. The Starwood hotels Marriott data breach was no joke. Hackers accessed 500 million customers’ personal information, dating back to 2014. According to CNN, the data included names, phone numbers, email address, passport numbers, dates of birth, credit card numbers and card expiration dates. Basically, everything a criminal would need to steal someone’s identity. At Axcet HR Solutions, we’ve been managing human resources, benefits, payroll, safety and workers' compensation duties for small- to medium-sized businesses in the Greater Kansas City metro area for more than 30 years. The content offered is offered only as a public service and does not constitute solicitation or provision of legal advice. This site should not be used as a substitute for obtaining legal advice from an attorney licensed or authorized to practice in your jurisdiction. You should always consult a suitably qualified attorney regarding any specific legal problem or matter.